Plenti+ Nursing Pillow + Nursing Cover - Colorful Gem is rated 4.8 out of 5 by 12. Rated 5 out of 5 by Amy L from amazing nursing pillow We are still in our nursing journey with our youngest. We have been using the ingenuity nursing pillow for about a month now and absolutely love it!! This is the first ever nursing pillow I have that comes with a nursing cover. We generally use covers when out or when we have guests over so it's really convenient that it comes with this. We also love the colors and the materials used. Both the pillow and cover are super soft. When not in use for nursing, we leave the pillow in the play pen area for our youngest and she uses it on a daily basis. She likes to crawl on top of it, sit in the little space in the middle, rest her head on it, etc. Our oldest (4) has been seen resting on it on occasion too. We definitely recommend this to all parents and their babies. 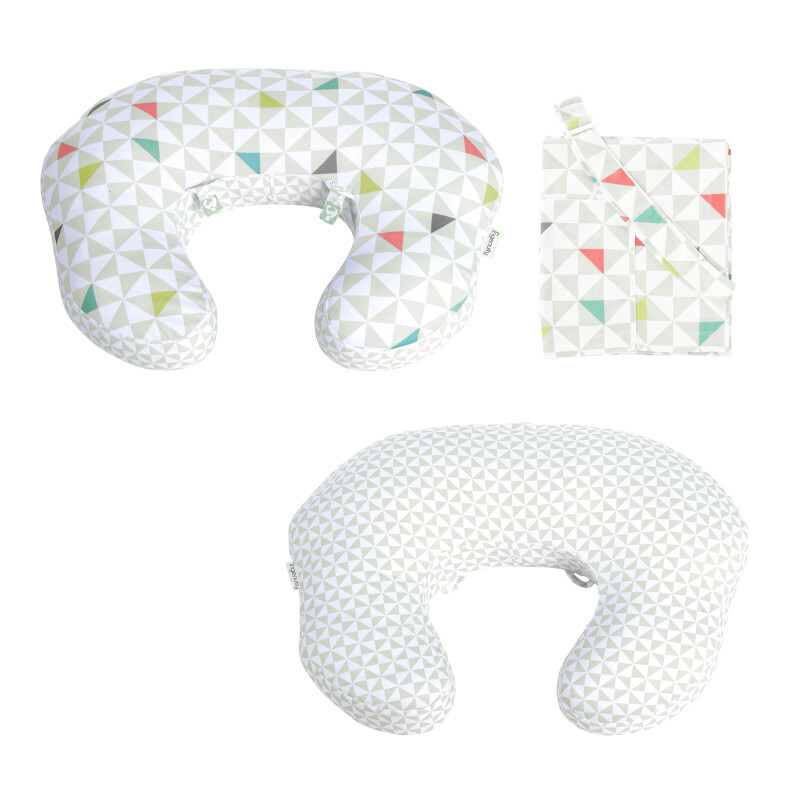 Rated 5 out of 5 by Momof3babies from Amazing pillow and cover! This pillow is super soft and just enough padding. Has been a lifesaver for us! Rated 4 out of 5 by karetzlaff from Very nice looking I received free for a review. Nice fabric. Only issue I have is it is a little small to fit around me. Rated 5 out of 5 by AdamM from Very functional! I love this nursing pillow and cover!! I love gender neutral and more modern prints and this pillow has both. This is one of the first nursing pillow I've ever seen that comes with a matching cover which is SUPER convenient! I love to bring the cover with me when we're out in public. I'd definitely recommend this product to any new parent! Rated 5 out of 5 by Ruby2 from My favorite so far! I've been through just about every nursing pillow and each of them have had flaws after using them with two kids, but so far this one has been my favorite! The pillow itself feels a bit heavier like memory-foam which seems to help it stay in place easier. I like the height of it because unlike other nursing pillows, I don't feel like I'm hunching over. I also love the fabric (its soft but still waterproof), storage pocket for nursing pads/creams/phone, and it comes with a nursing cover. Rated 4 out of 5 by Jess4113 from Nice design, pretty fabric. Happy overall with the product. I really like the fabric design. It is modern but also cute, and neutral. I like the tabs to remind you which side you need to breastfeed next. That is something that no other nursing pillows have. 2 things I would change slightly. I feel it is overstuffed, makes it a little hard and not very pliable. The other thing is I wish the opening were a little wider to fit around my front rather than just one side, although using it on the side, it also serves as a lumbar support which is nice. Love matching the nursing cover. Simple to wrap around for quick coverage. Rated 5 out of 5 by Acklarfeld90 from I love the design! I love this nursing pillow! The shape is comfortable to feed a baby or toddler and the cover design is neutral, but still friendly for either gender. Rated 5 out of 5 by Nursemom from The best on the market My little and I both absolutely loved this product. It’s the perfect size and firmness. The design was super cute and gender neutral. Plus the nursing cover to match was a lifesaver. We have a similar product and much prefer this one. This products design is more user friendly for feeder and baby, compared to similar products. Perfect for breast and bottle feeding. The product is well made even the protective covering for storage.